To put it simply, Hacksaw Ridge is an outstanding film. Without question, it is on par with Saving Private Ryan. The movie tells the tale of a conscientious objector who refuses to carry a rifle but is determined to serve his country. From boot camp to the battlefield, it shows the rigors Desmond Doss went through and his amazing acts of courage. It’s a film that is touching as it not only shows the chaos and brutality of war, but the heroism and selflessness that can go with it. 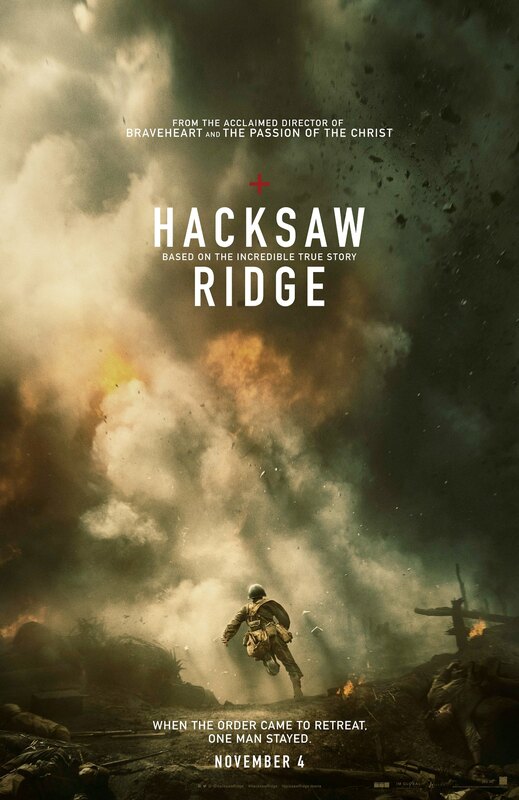 While Hacksaw Ridge is a great movie, it is very different from Saving Private Ryan. First off, this movie focuses on only one battle, and it’s in the Pacific theater. It also differs in that the movie sets the stage before the war, showing Desmond as a child and then later on showing how he winds up in the military and his struggles through boot camp as a conscientious objector. Viewers get to see him fall in love, deal with his father, his faith and the horrors of war. The scope of the film provides a very nicely focused tale that encapsulates Desmond’s journey from child to war hero. Yet the real accomplishment is how the movie brings that tale to life. The movie opens with a glimpse of the battle that is to come, before breaking off to show a portion of Desmond’s life as a child. It then jumps forward to show him as a young man dealing with love and his desire to serve his country. Andrew Garfield does a superb job in the lead role. Through his acting, the character of Desmond Doss feels genuine and believable. He captures the audience and takes them through the story and all its hurdles. Along the way, the rest of the cast brings color and emotion that completes the film. From the colorful drill sergeant played by Vince Vaughn, to the sincerity of Desmond’s future wife, Teresa Palmer, the acting is top notch. Hugo Weaving, who plays Desmond’s father, steals the show for his several scenes as he provides some very emotionally powerful performances. Then there are the war scenes. Hacksaw Ridge takes the portrayal of battle to a new level. As impactful as Saving Private Ryan was, the battle scenes in Hacksaw Ridge are even more immersive. Scenes play out showing the chaos and brutality of battle. Death comes in an instant and the fallout is the horrors of human carnage. The movie portrays the combat in several waves, showing the ongoing intensity of battle. There is no shaky cam with rushed, blurry close-ups to mimic the action of battle. Instead, there are bursts of battle shown in their full clarity. The camera does not shield the viewer from the violence. In the end, however, the battle scenes are not there to wow viewers. Hacksaw Ridge isn’t a film that glorifies the war. The point and the success of the film is in how it highlights the bravery and courage of Desmond Doss as he goes into battle, without a weapon, and selflessly risks his life to save others over and over and over again. In bringing that character to life, this film weaves a story that is emotionally impactful and inspiring. If you haven’t seen it yet, I highly recommend catching this one in the theater while it’s still playing. I give it a five out of five metal bikinis.